The secrets of digital image editing - explained in plain English! Photoshop CS3 is a powerhouse, and here's the fast and easy way to get up to speed on all the coolest features. This friendly guide helps you get images into Photoshop - and then turn them into dazzling works of art. You'll see how to work in the right file formats, master the Brushes palette, get creative with filters, convert color to grayscale, and more! Illustrations note w. 400 col. figs. The secrets of digital image editing -- explained in plain English! Photoshop CS3 is a powerhouse, and here's the fast and easy way to get up to speed on all the coolest features. This friendly guide helps you get images into Photoshop -- and then turn them into dazzling works of art. You'll see how to work in the right file formats, master the Brushes palette, get creative with filters, convert color to grayscale, and more! Part I: Breezing through Basic Training. Chapter 1: Welcome to Photoshop! Chapter 2: Knowing Just Enough about Digital Images. Chapter 3: Taking the Chef's Tour of Your Photoshop Kitchen. Chapter 4: Getting Images into and out of Photoshop. Part II: Easy Enhancements for Digital Images. Chapter 5: Adding Dark Shadows and Sparkling Highlights. Chapter 6: Making Color Look Natural. Chapter 7: The Adobe Camera Raw Plug-In. Chapter 8: Fine-Tuning Your Fixes. Chapter 9: Common Problems and Their Cures. Part III: Creating "Art" in Photoshop. Chapter 11: Precision Edges with Vector Paths. Chapter 12: Dressing Up Images with Layer Styles. Chapter 13: Giving Your Images a Text Message. Chapter 14: Painting in Photoshop. Chapter 15: Filters: The Fun Side of Photoshop. Chapter 16: Streamlining Your Work in Photoshop. 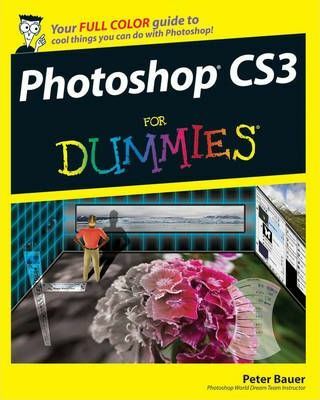 Chapter 17: Introducing Photoshop CS3 Extended. Chapter 18: Pete's Top Ten Favorite Photoshop Tips and Tricks. Chapter 19: Ten Reasons to Love Your Wacom Tablet. Chapter 20: Ten Reasons to Own a Digital Camera. Layers magazines, a featured columnist for PlanetPhotoshop.com, and a software documentation writer for a variety of Photoshop- and Illustrator-related products. An Adobe Certified Expert, he also appears regularly as a member of the Photoshop World Instructor Dream Team. A Photoshop Hall of Fame nominee, in 2005, Pete was presented the Pioneer Award by NAPP, only the second person so honored. As NAPP Help Desk Director, Pete personally answers tens of thousands of e-mail questions annually about Photoshop and computer graphics. He has contributed to and assisted on such projects as feature film special effects, major book and magazine publications, award-winning Web sites, and fine art exhibitions. He has taught computer graphics at the university level and serves as a computer graphics efficiency consultant for a select corporate clientele. Pete and his wife, Professor Mary Ellen O'Connell of the University of Notre Dame Law School, live in South Bend, Indiana. Despite being considered a world-class technogeek, Pete still plays organized ice hockey.